Most website owners get scared or confused by when I mention Google Search Console. This blog post will walk you through the basics on how to use Google Search Console, the most useful part of Google Search Console for improving your search traffic, how to interpret the data in Google Search Console, and how to improve your content to get more clicks in just a minute! Google Search Console is a free tool given to us by Google in order to help us check on issues related to indexing (e.g. how easily Google can find your content), penalties in regards to web search (e.g. if you use black hat methods), and peeking at our keywords. If you haven’t yet set up your Google Search Console, you’ll want to click this link to set yours up. Be sure to ensure that you set up a https:// version if your website is https://. You might need to go into the back-end to verify ownership of your website. It’s important to note that your Google Search Console data may not perfectly match up with your Google Analytics, but it’s not worth obsessing about this. We are more interested in where we rank and if people want to click our SEO snippets. You should see an upturn in your traffic if you improve your website based on Google Search Console. This is the most important tab if you want to improve your traffic to your website, but let’s first go through some important definitions that will be key to understanding your data in Google Search Console. Date: The time period you’re interested in. 1 month is good for larger websites while 3 months is better for smaller websites. Depending on recent algorithm changes, you might want to limit your results to one month back. Position: When you search for something on Google, this is the number of slots down from the top you’re located at (after ads). If you’re first, you’re in position #1, etc. Impressions: How many people searching have seen your SEO snippet. Average position: Your position across all queries. Not important. CTR: CTR stands click-through rate. Let’s say you’re in position one, this is the percentage of people who see your SEO snippet and click it. We’ll get into good CTR soon! Queries: the keywords/things that people are searching for. Clicks: This is simple: How many people click to your website for this query. I don’t recommend focusing on this beyond sorting by the most popular queries. For some reason, you don’t see CTR and average position by default, so I recommend clicking the boxes to make them colorful. From here, you’ll want to scroll down past the chart. I’ve sorted by clicks, however you can sort by position. I recommend sorting by impressions or clicks as these queries have the most potential for improvement as these queries will be more well searched. Imporatnt note: Your click-through rate can be impacted by whether your query has ads on top of it as an average user searching for a tour of a city might click an ad that advertises this before clicking your result in slot #3 as it instantly fulfills their search intention. This is simple: the closer you are to the top, the more likely that people will click your website. The top 3 results get 50% of the clicks in general. As you might imagine, you should see more clicks. Below, I’ll include the click through rate per position, so you can see if you’re beating the average–or you have improvements to make. Let’s go through Example 1 (green). This query has 47 clicks, 277 impressions, a CTR of 17% and a position of 1.5. This is pretty okay, however, this query can be improved a bit. Ideally, with a click-through rate closer to 21% or more. Example 2 (blue) has 23 clicks, 62 impressions, a CTR of 37%, and a position of 3.6 This click-through rate is really good. This query is doing so well and people are clicking through. In this case, give yourself a pat on the back. You’re killing it! Example 3 (red) is the one that needs to be improved the most. It has 18 clicks, 1000+ impressions, 1.8% CTR, and a position of 6.7. This can be improved quite a bit as the CTR should be at least 3%. I usually recommend searching for your query on an anonymized tab. This will allow you to see what the search results are, what it looks like, and how your snippet appears. From here, you might find that Google is pulling through text rather than your SEO snippet, which can negatively impact your click-through rate in some cases. Before you change anything, I’d look to see what kind of titles and SEO snippets other results have. Think about what will describe your article and make your result more clickable. It might be that you might realize that your article or webpage is not a good answer to the query and you might want to read this article in this case. I usually just write down the current SEO snippet/title as well as the position/click-through rate for the query in a Notepad or Excel. Then, I go to edit my title/SEO snippet/article (if the text is showing instead of the snippet) to try to make my title, text (if showing), and SEO snippet more clickable. Just like good sourdough bread, you need to give your result some breathing room to rise. 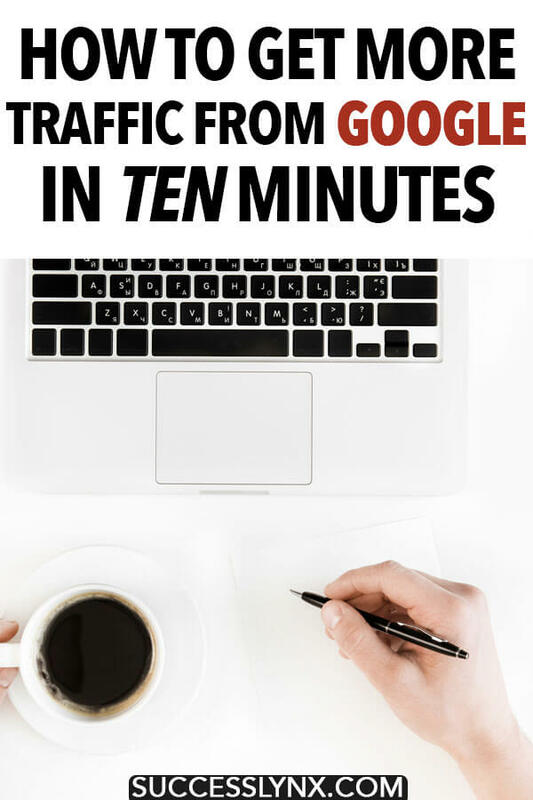 Wait 1-3 weeks depending on your website traffic. I usually check to see if the click-through rate has improved. If not, I edit it again until it improves. It’s good to note that I don’t change my titles/keywords that much. Maybe once a quarter. I focus on high-traffic keywords that I already rank on page one for, rather than long-tail ones that I’m not ranking yet for. As you check your Google Search Console more often, you’ll find new keywords that you’re ranking for! This is the beauty of SEO: you can sit back and relax while your posts rise! It might take a few days for Google to index your website and reflect the changes you’ve done, so don’t panic if you don’t see the change immediately. Have you improved a title or meta description using Google Search Console? Let me know how it went!